Scientists have observed a gigantic gas halo stretching from Andromeda – our nearest major galaxy. It goes towards our own Milky Way and if it could be seen with the naked eye, it would be the diameter of 100 full moons. Halos are the gaseous atmospheres of galaxies. Astrophysicist Nicolas Lehner of the University of Notre Dame, Indiana, who led the study, explains that the properties of these gaseous halos control the rate at which stars form in galaxies. Andromeda, also known as Messier 21, or M31, is our closest major galactic neighbor, at 2.5 million light-years away. It is also 25 percent more luminous than the Milky Way and contains about 1 trillion stars, twice as much as the greater estimates for our own galaxy. Both Andromeda and the Milky Way are part of a cluster called the Local Group, containing about 45 other major galaxies that we know of. The scientists said that if the halo could be viewed with the naked eye, it would be 100 times the diameter of the full moon , while Andromeda galaxy looks about six times the diameter of the full moon. The halo which appeared to be about six times larger and 1,000 times more massive than previously thought, stretches about 1 million light years from Andromeda, halfway to the Milky Way. Scientists say it contains as much mass in its diffuse gas as half of the stars in the Andromeda Galaxy. But the gas is invisible, that is unless you find a bright enough background object in the universe whose light is affected by the intervening gas in the halo. The most convenient one is a quasar, a star-like object. The quasar’s extreme luminosity allows researchers to measure the difference in the intensity of its glow, much in the same way scientists look for planets orbiting distant stars. 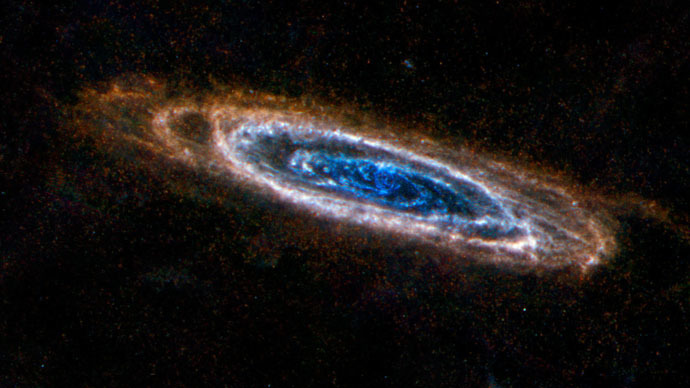 Hubble possesses a unique capability to study ultraviolet light at very high spectroscopic resolutions. This is especially good for halos, as it allows getting fundamental information about their nature and extent. It’s just a matter of finding enough sources of ultra-bright light. Although scientists observed other halos in the past, this one is by far the largest located so close to us. The team used data from 18 different quasars located at varying distances. Lehner said that this is “a new milestone, because, typically, only one quasar is used to probe the halos of galaxies beyond the Local Group” while in this case “we have assembled a large sample of quasars that directly demonstrate the true extent of the halo of a single massive galaxy." The team pooled Hubble’s quasar data for the last five years, combining it to arrive at a more complete picture of the halo. It hopes in future to find more quasar data to get an even better understanding of the halo’s relationship to its galaxy. But there is also the exciting possibility that Milky Way might have a halo of its own. In this case, our two galaxies’ halos could merge way before the galaxies’ actual collision which is expected to give birth to a new elliptical galaxy in about 4 billion years.